He said to him a third time, Simon, son of John, am I dear to you? Now Peter was troubled in his heart because he put the question a third time, Am I dear to you? And he said to him, Lord, you have knowledge of all things; you see that you are dear to me. 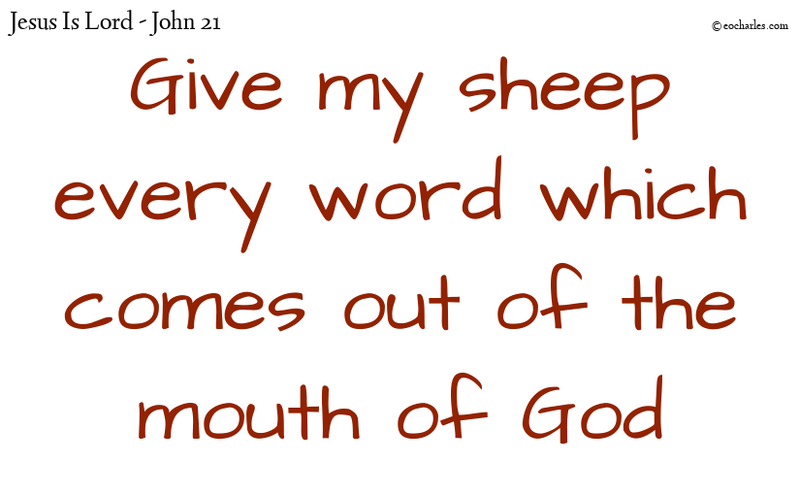 Jesus said to him, Then give my sheep food. 1)Mat 4:4 But he made answer and said, It is in the Writings, Bread is not man’s only need, but every word which comes out of the mouth of God. 2)Deu 8:3 And he made low your pride and let you be without food and gave you manna for your food, a thing new to you, which your fathers never saw; so that he might make it clear to you that bread is not man’s only need, but his life is in every word which comes out of the mouth of the Lord. 1. ↑ Mat 4:4 But he made answer and said, It is in the Writings, Bread is not man’s only need, but every word which comes out of the mouth of God. 2. ↑ Deu 8:3 And he made low your pride and let you be without food and gave you manna for your food, a thing new to you, which your fathers never saw; so that he might make it clear to you that bread is not man’s only need, but his life is in every word which comes out of the mouth of the Lord.